A very affordable small slim line storage unit for limited spaces. 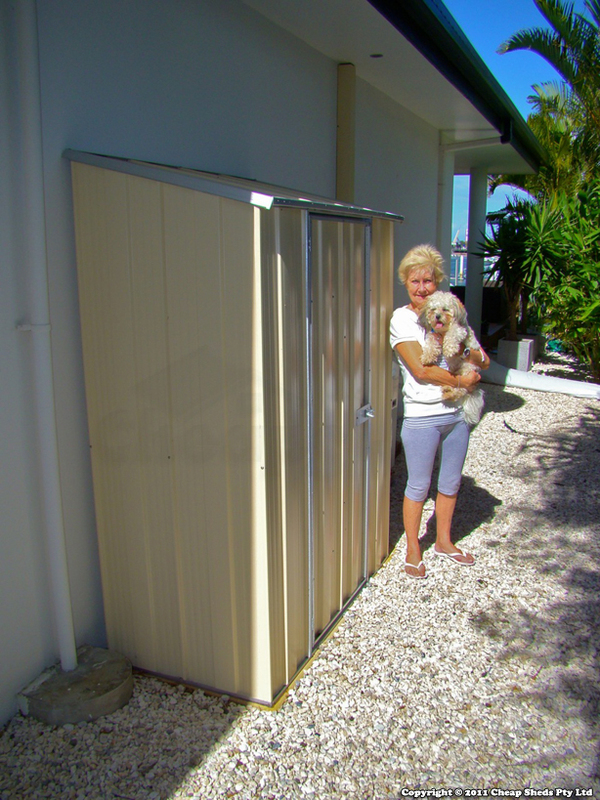 Its skillion roof makes it an ideal garden shed to be placed against a wall or fence to save even more space. The zinc Yardsaver S42 garden shed is a very affordable small slim line storage unit for limited spaces. This storage unit is an ideal garden shed to be placed against a wall or fence to save even more space. You can keep your mower and whipper-snipper in it and a lot of other gardening tools as well. Storage unit supplied with step by step assembly guide illustrated with pictures to make the installation a fun and easy project. Having a home with a water frontage on the Sunshine Coast, we have a lot of outdoor furniture. This furniture has many large cushions. We don’t want to leave these cushions out in the weather when not being used. I looked at many storage solutions before deciding on a small shed. I searched the web and found Cheap Sheds. They offered a large range of shed sizes at the best prices. I ordered the size shed I felt was best for my requirement. Some days later I picked it up at a local depot and soon had it built. The instructions were extremely easy to follow and I thoroughly enjoyed the experience of putting it together. This shed provides easy access, keeps the cushions out of all weather and out of sight. What’s more it looks good. This shed is our prefect storage solution. Can you put the door to the side instead of the middle? Thank you for your question. This particular shed is designed and engineered to have the door in the middle of the front wall and cannot be placed on the side.